FS2004 – Erbil International Airport. Erbil International Airport (IATA: EBL, ICAO: ORER), is the main airport of the city of Erbil in Iraqi Kurdistan. The airport has facilities for both cargo and passengers. The airport was built at the beginning of the 1970s as an Iraqi military base (Z16J). The airstrip was used as a military base until 1991. On 26 May 2005, the airport was given the ICAO airport code, ORER. The new airport is next to the old airport (Z16J) and has one of the world’s longest runways, 4,800 m × 75 m (15,748 ft × 246 ft) and is equipped for ILS CAT II operations. This Airport is not included in FS2004, it is AI ready and has some small, medium airliner,cargo and GA parking space. 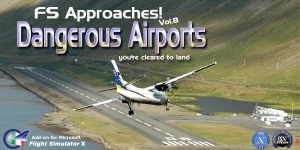 The airport uses 3rd party library objects as listed in the readme file. This entry was posted on April 14, 2018 at 13:32, and is filed under Scenery. Follow any responses to this post through RSS 2.0.You can leave a response or trackback from your own site.